Why Has Date Changed for Start of Spring? The green line is the path (orbit) the Earth makes around the Sun. 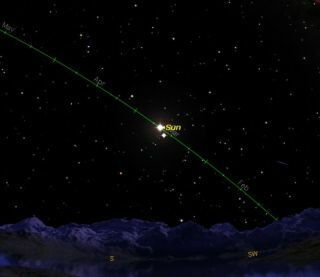 Shown is the Sun's location along this ecliptic line as of March 20, as seen from Earth. The other bright object is Mercury. "Have the wedding on March 21 - the first day of spring!" Unfortunately, if George had gone through with the nuptials (and Seinfeld aficionados know why he never did), he would have been a full day late. You see, in America, spring no longer falls on March 21. In 2005, for instance, the vernal equinox, the first day of spring for the Northern Hemisphere, comes on Sunday, March 20 at 12:33 GMT, or 7:33 a.m. EST (4:33 a.m. PST). Now this doesn't seem right. I mean, when we were all growing up, the first day of spring was always on March 21, not March 20, right? Now all of a sudden spring comes on March 20. While it's true that we've traditionally celebrated the beginning of spring on March 21, astronomers and calendar manufacturers alike now say that the spring season starts one day earlier, March 20, in all time zones in North America. Unheard of? Not if you look at the statistics. In fact, did you know that during the 20th Century, March 21 was actually the exception rather than the rule? The vernal equinox landed on March 21, only 36 out of 100 years. And from 1981 to 2102, Americans will celebrate the first day of spring no later than March 20. In the years 2008 and 2012, those living in Alaska, Hawaii and the Pacific, Mountain and Central time zones will see spring begin even earlier: on March 19. And in 2016, it will start on March 19 for the entire United States. A year is not an even number of days and neither are the seasons. To try and achieve a value as close as possible to the exact length of the year, our Gregorian Calendar was constructed to give a close approximation to the tropical year which is the actual length of time it takes for the Earth to complete one orbit around the Sun. It eliminates leap days in century years not evenly divisible by 400, such 1700, 1800, and 2100, and millennium years that are divisible by 4,000, such as 8000 and 12000. Another reason is that the Earth's elliptical orbit is changing its orientation relative to the Sun (it skews), which causes the Earth's axis to constantly point in a different direction, called precession. Since the seasons are defined as beginning at strict 90-degree intervals, these positional changes affect the time Earth reaches each 90-degree location in its orbit around the Sun. The pull of gravity from the other planets also affects the location of the Earth in its orbit.